While enjoying a salad for breakfast would be frowned upon in most regions of the world, they are actually par for the course in the Mediterranean. The Mediterranean breakfast salad recipe below is one such example. 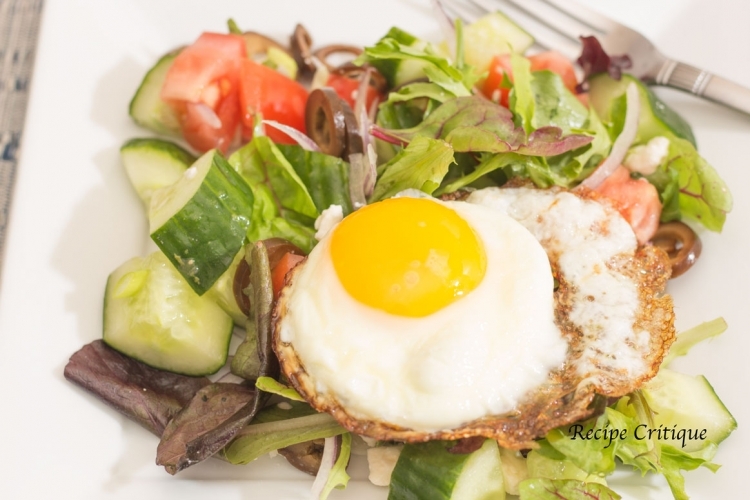 Full of healthy nutritious greens and vegetables and topped with a crisp fried egg, this breakfast salad could be enjoyed any time of the day. Begin by selecting your base. 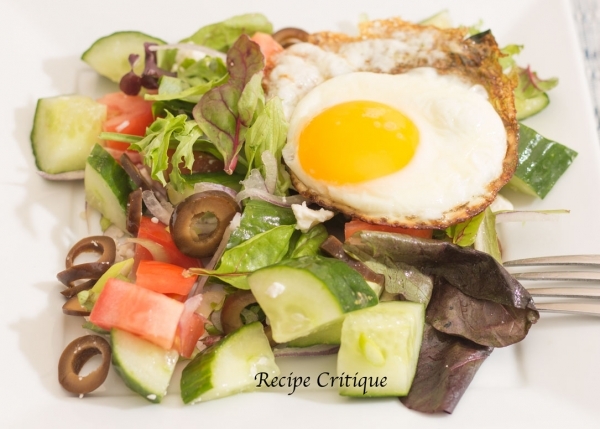 In this Mediterranean breakfast salad I began with a bed of spring mix greens, added the traditional toppings of cucumbers, tomatoes, olives, a little red onions and a sprinkling of feta cheese. Finally, for total satisfaction, I topped the whole dish with a glorious crispy fried egg. I don’t mind admitting I was in heaven. Other options could be a base of grains such as brown rice, farro or quinoa, and if you have it on hand throw in some spinach for added nutrition. Top with chopped zucchini and green beans and the rest of your favorites. Using grains with vegetables also allows you to eat this as a heated breakfast. Sometimes the tummy just craves something warm. Or if you are in the mood for something sweet, add some fresh fruit. I love to add berries or mandarin orange segments to satisfy my sweet side. Starting your day off right with a breakfast salad gives you a great reason to get out of bed in the morning, and provides a huge head start on the recommended daily consumption for fruits and vegetables. This recipe makes eating 5 to 9 servings a whole lot easier to accomplish and really puts you on the path to a healthier life. Add the first 6 ingredients in a bowl. Season with a pinch of sea salt and some black pepper if desired. Sprinkle the fresh lemon juice and gently toss to combine. Heat a small non-stick skillet over medium heat. Add tsp of EVOO and heat until just shimmery. Add the egg and gently fry until the edges are crispy. Plate the salad and top with the egg. This is as easy as breakfast can get. The ingredients list is subjective, depending on how many you need to serve, just add more.